I needed a train trip — I couldn't go very far west from California, my last few trips took me north, I had no interest in going south, so east it was. After numerous journeys to the Ogden/Salt Lake area, it was decided that I would "push the envelope" and head for Denver, which meant crossing the Rockies and going across the Nevada desert, both of which sounded interesting at the time. I caught a southbound out of Dunsmuir early in the morning on the back of what would soon manifest itself as a very wobbly grainer. After going in the hole somewhere down the canyon to let a northbound by I switched to another grainer a few cars behind mine and it proved to be a much better ride. The next several hours were spent drinking wine and taking in what little scenery the Central Valley had to offer. We got to Roseville around noon and I hopped off just before the Rainbow Bridge, then made a side trip to a café for a food and bathroom stop. Since I was at the beginning of a train trip, and I spent most of it sitting on a relatively clean piece of cardboard, my appearance when I sat down at the table was not much different from anyone else who might dine here, and the waitress was all smiles when she took my order. On the way back from another trip consisting of several days of riding trains in summer heat I didn't receive the same cheerful service, and was asked to leave my pack outside. My take on the whole thing was that it seemed like the more letters and words that they used to describe the food, the poorer the service one could expect to receive. I mean, after all, this was Roseville, not San Francisco. With my memories of the eating experience consisting solely of how refreshed I felt after using their bathroom, it was time to hit the liquor store and get into character. As I walked across the freightyard to get to the "other" side of town I saw a string of cars with power already hooked up heading either north or east, so I picked up the pace and made my stop at the liquor store as efficient as possible — grab several bottles of wine, a loaf of French bread, some cheese, pay for them, stuff them in the pack, and walk quickly back to the yard. This operation was done with dispatch and elan, and in minutes I was back alongside the mainline, reading the train just a few tracks over from where I stood. This one had four units, almost guaranteeing that it was going east, but the head end crew wasn't there yet, so there was no one to confirm this. Walking back along the train I still couldn't figure out one way or another which way the train was headed, as both northbound and eastbound trains leave out of the same part of the yard, with the northbounds making big left turn and the eastbounds continuing straight ahead. 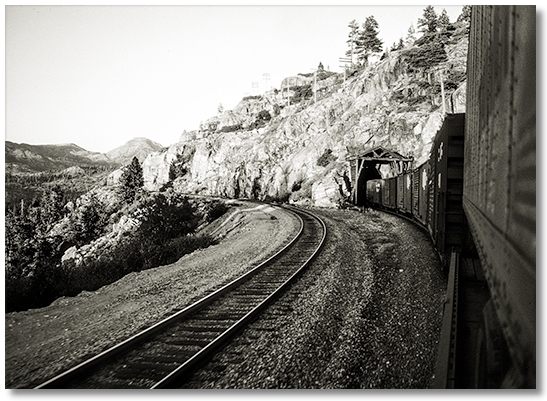 After passing a long stretch of loaded boxcars I came to several piggyback trailers, and, never having seen this combination going north, I concluded that the train was going east and I should get on one of the trailers and hunker down. Looking up at the grease-splashed underbelly of the trailer and the equally greasy axles, I knew that if I stopped at that same café in Roseville on my way back I'd surely get the bum's rush. Resentfully I shoved my pack up into the innards above one axle and leaned back against the wheels, not finding it necessary to conceal myself until we were actually pulling out. Just about the time that boredom was prompting me to retreive my pack and break out a bottle of White Port I heard the air build up, so I put that thought on hold and anxiously awaited our departure. I was close enough to the head end to look up and see if we kept going straight or turned to go back up north, and prepared myself to bail off if I had to, but we kept on going and after passing a few street crossings I climbed down and crawled up to get my pack. The cardboard was folded properly, a bottle of wine was opened, and I toasted the beginning of my real train ride as we blasted our way through Newcastle. The afternoon was spent drinking wine and sight-seeing as we wound our way around hills, into gullies and through snowsheds. Coming into Truckee I crawled up onto the axle again, then back down behind the wheels, then back up again as we came into Reno and Sparks for a crew change. After crossing the Sierra Nevada range, the scenery east of Sparks became a bit monotonous, so I rolled out my bag and took a nap, then went to sleep for good when it got dark around Carlin. Sometime during the night we slowed a bit and I saw the lights of Ogden ahead, so it was time to roll up. I had no idea if this train was going any farther so I got ready to bail off at the small shanty just past the overpass and ask someone if they knew anything about my train. I was close enough to the head end that if I needed to I could always run over and catch a ride on the rear of my train if necessary, as we slowed to a verifiable crawl just after I jumped down. Fortunately there was a switchman outside the shanty rolling our train by, and he said that after a bit of work my train would be going on to Denver, which was music to my ears! We both stood there and watched the remainder of the train pass by — he to spot any bad brakes or dragging whatever and me to look for another ride. Several cleanish looking grainers passed by and my work was over. I thanked the guy and followed my train down into the yard. An exceptionally clean grainer was found and I climbed up and again rolled out my gear, this time thankful that I didn't have to worry so much about my stuff blowing away like I did on the piggyback trailer. It was unusually warm, and I climbed down for a moment to sit on a flatcar on the next track that would give me a better look at the night sky. There was no moon to be seen, and the scant lights of Ogden did little to block out the zillions of stars overhead. I was already far enough east of where I live to notice that it was a completely different "sky", and familiar constellations were replaced by new ones. Eventually we aired up again and continued south down to Salt Lake City, where I was too tired to hide so I remained in my bag as we crept through the yard and the adjacent downtown area. Soon we were back up to track speed, so I rolled over and drifted back to sleep. Later I sensed that we were going much slower, and figured that we were climbing up to Soldier Summit, which is where I was greeted with a gorgeous sunrise as we sped down the east side toward Green River. The Utah scenery was too good to miss stuffed in my bag, so I sat up and enjoyed a fresh bottle of White Port as we traveled along the base of the Book Cliffs, where I could look south toward Moab and all of the country that Utah is famous for. After awhile the Green River came into view alongside, and eventually Grand Junction, where I officially rolled up and hunkered down as we passed through the Rio Grande yard. After a short wait in Grande Junction, we continued east, unfortunately having the highway right alongside for quite a ways. After going across Nevada and Utah, it felt a little odd seeing people again. Soon we veered away from the highway and passed through a deep gorge with very tall cliffs on each side and the ubiquitous river winding along the bottom. At some point I went back to sleep and shortly we were winding our way down the east side of the Rockies going back and forth and not seeming to get any lower in altitude. Lights in the distance gave me the roll-up-your-gear signal, and I crouched at the edge of the car, tying to figure out where we were and when I should get off. Closer and closer to town we got, and slower and slower we went, until I spotted a nice loading dock next to the tracks and decided to end my rail trip now and worry about walking into town in the morning. I hopped off and walked back to the dock, where a copious supply of cardboard was found to construct a sleeping platform. Some bread, cheese, and wine and I was asleep in minutes.